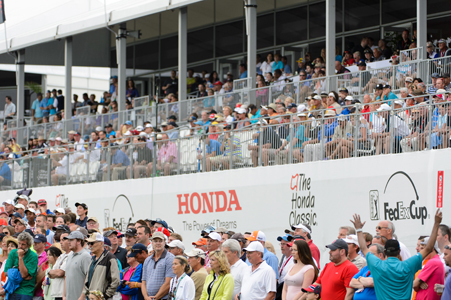 The Honda Classic was named the “Most Fan Friendly” event on the PGA Tour at the annual “Best Of” awards, presented at the Tour’s annual meeting in La Quinta, California. The Honda Classic has made a massive commitment to the spectator experience since moving to the Jack Nicklaus-redesigned Champion Course at PGA National in 2007. The tournament was one of only 10 events to receive awards from the Tour. The Honda Classic offers an extensive series of activities and entertainment elements that have helped make it one of the elite events on the Tour. The “After Play” concert series on the Michelob Ultra Terrace features entertainment by local bands and special guests, which have included award-winning stars Kenny G and Branford Marsalis. The Tire Kingdom Fireworks Spectacular lights up the skies above PGA National on Friday and Saturday nights. There are several seating options with public hospitality at “The Bear Trap”—so named for the Golden Bear’s daunting three hole challenge at Nos. 15–17—including the Gosling’s Dark ‘N Stormy Bear Trap, Club Ketel One and the FPL Patio at the 17th hole. The Wine Garden, also located at the 17th hole, allows spectators to watch golf while sampling wines from various parts of the world. Military personnel past and present are honored with free admission and hospitality at the 17th hole through the Military Appreciation Program. The program is sponsored by United Technologies – Pratt & Whitney and Sikorsky and presenting sponsor Wells Fargo. Kids under 15 are always admitted free to The Honda Classic and enjoy the action from special Kids Boxes located at the 17th and 18th greens. There is also a Junior Clinic on Tuesday featuring PGA Tour professionals. Tire Kingdom Family Day on Saturday includes several activities for kids and families including the Kids Club, which offers games and activities as well as free child care. The first 1,500 kids receive a free giant golf ball for autograph collecting. The Honda Classic has even had an art show on the golf course through a series of canvases created by Bulgarian artist Kiril Jeliazkov in 2008. The 2015 Honda Classic will be played February 23-March 1, 2015, with Russell Henley defending his title against a world-class field. Proceeds will again support South Florida Children’s Charities, which has as its primary beneficiary the Nicklaus Children’s Health Care Foundation.